Windows 8 wasn’t all too well received, hardly a secret if you follow the tech press, neither by customers nor by businesses. There are a few folks who like it but they are, like those Windows Phone enthusiasts (that really do exist), a very minor minority (without report). About a year ago, I started using Windows 8.1 as my main operating system (which I’ve written about a few months later). Before, it was just a necessity to get the Soundblaster audio card to work. However, going through the same positional-sound problem again after upgrading from 8.0 to 8.1, I’m sure using Windows 8 fixed the problem by accident. Creative’s drivers are just a bulk load of crap, as they’ve always been. Had I not had the iMac as a work computer at that time, I’m not sure I would’ve installed Windows 8 instead of 7, but rather gotten rid of the Soundblaster Z. If you’ve read the post about the sound card, you know I was one of the many people that had an axe to grind with this OS. But, I bit the bullet and went at it with an open mind, just like I did with Vista. As it turns out, it isn’t bad at all. The update to Windows 8.1 really helped. If you’re not a masochist that tries to fuel his hate by working in a way that lets the OS appear worse than it is (the troll feeding himself), it is not too hard to actually live solely on the desktop and not be “bothered” by the modern environment. The only time I have to deal with the start screen is when I try to run an application that is not pinned to the taskbar because I don’t use it frequently enough so that it is worth reserving a spot. In this case, the start screen serves the same purpose as the start menu: a place to type an app’s name in a search bar. That’s about 95% of what I use it for. I know what and how much of an application’s name I have to type to be able to just hit Enter and launch it. I don’t even really look at it while doing so. The other 5% don’t happen very often and in these rare situations I can handle the confusing and cluttered application screen of Windows 8. Only then I really see the value of the classic start menu. 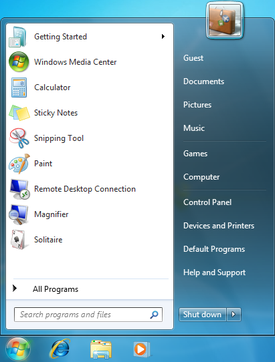 The “All Programs” list is much more concise compared to the application screen of Windows 8. But apart from that, the start menu is just another place with app-icons, nothing special to whine about. I actually prefer right clicking on the Windows-Button in Windows 8 to get a list of places in the system to go to, rather than finding them in any variant of a start menu (which I would do so by using the search feature anyway). It is even more efficient than Windows 7 in that regard. 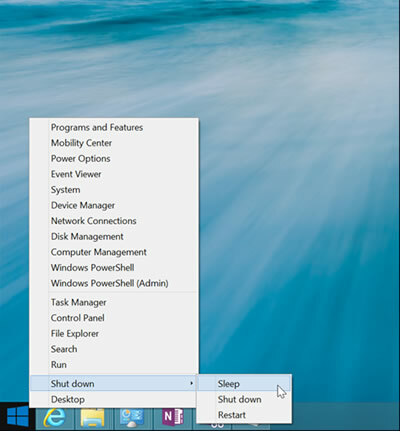 I think the Windows 8.1 home button context menu shows more places an advanced user might want to visit by default than the Windows 7 start menu. And it even uses less space at that. Windows 8 also has a few nice things to offer. For one, I like the cleaner (the contemporary word is “flat”) design. Wherever the user interface doesn’t look like Windows 95 its widgets are very attractive. I also prefer the revamped task manger, the file copy dialog on conflicts, the copy/move progress bar or the ribbon in the explorer. Yes, I like the ribbon! Welcome to my world. It’s going to get even crazier. But not only did I come to like Windows 8 on the desktop with a mouse and keyboard. As time went by, I acquainted myself with the modern environment. When Windows XP finally died its noble death and my mother needed a new computer, I started to appreciate the concept of having a full screen app launcher and only full screen applications. Explaining the XP start menu, shortcuts or the task bar to my non-techie mother wasn’t easy. Having the OS basically work like a mobile operating system made my life as tech-support more of a joy (well, “joy” may not be the most accurate way of describing tech support for technology averse relatives). There are these “large squares” that sometimes show information and mainly launch applications, basically big desktop icons. Easy to grasp. Going back to the tiles to launch another app is only a push of the Windows key away, just like the Home Button on iPhones or iPads. Easy too. And they are always in the same place, much unlike the pre-Windows 7 taskbar where it depended on the order you started the applications in. Although I couldn’t make use of this concept myself for what I do on a computer, I started to embrace its idea. This finally culminated in the purchase of the Surface Pro 3, a very nice piece of hardware that tries to be your laptop as well as your tablet. While many in the tech press say it does neither exceptionally well – while still being praised as the best approximation of the effort – I beg to differ. Before I go on, understand that I liked Windows Vista, I now like Windows 8.1 and I also have a Windows Phone. What I’m saying is: I’m living on my own island of crazy-talk where I ride on unicorns and hunt trolls for fun. Now that I have questioned my own sanity I can tell you that the Surface Pro 3 is the perfect device for me. It is said to be a bad tablet because it doesn’t have the same app ecosystem as Android or iOS. True, but, as is the case for me on Windows Phone (read the section about “Software”), I’m not an app buff. I get by with very little 3rd party apps and I don’t miss a single thing. Well, not entirely true: I miss a decent Comixology app, but when Amazon acquired them the iOS app went downhill as well because they immediately removed the shop. All I really need is a browser, a PDF viewer and… well, that’s about it. Other apps are either just frontends for news websites like MSN News or Tagesschau or video on demand providers. To read some news, I don’t need an app, the website is enough – although MSN News is pretty convenient, especially on the phone (and nicely done as well). To watch YouTube, I don’t need an app (certainly not the confusing one from Google). To watch TV shows, I sit on my couch in front of the TV. However, the Surface screen has a nice size and stereo speakers so watching a movie can be enjoyable. I do use a few desktop applications on my tablet though. That’ll probably not happen any time soon on an iPad. How about something positive about the modern environment? I really, really like the clean interface. There’s no app-chrome, only the content. This is especially nice when browsing the web with Internet Explorer. Yes, Internet Explorer! Other mobile browsers on the tablet “waste” space by showing the tabs all the time. Modern IE doesn’t and therefore the website takes up the whole screen real estate. Beautiful. That’s why browsing the web (including YouTube) works so well and renders a certain kind of app unnecessary. Another thing I really appreciate over the iPad is when I’m writing something for my blog. The Surface is much more efficient, especially when research is involved. I can always have two windows open side by side (at the same time! ), the browser and Word (modern or desktop, doesn’t matter), to look something up and type what I learn from it. The few times I have done this on the iPad have ended up in a wild use of the four-finger swipe to switch between Safari and Byword (no Microsoft Office apps at that time). For me it is hard to imagine that some people try to get everything done on the iPad and be really efficient at it. Regarding desktop applications, there’s the Microsoft Office suite. While it is now available on iOS as well (and supposedly pretty good), I prefer the larger screen of the Surface Pro 3 and the way the kickstand and type cover make for a nicer laptop replacement than any iPad case. Try to select some text with your fingers and not get frustrated. I was never able to. The touchpad on the type cover solves this problem for me. Then there’s Visual Studio, iTunes (try to sync an iPod Shuffle with an iPad), GitHub or anything else a programmer needs. This is where the Surface Pro 3 is my Laptop. I’m writing these lines sitting in my bed with the kickstand positioning the screen at a nice angle and the type cover to… wait for it… select text – just kidding, type of course. Here comes the big but. I don’t travel. I don’t need to use my Surface on a train, on an airplane or as a passenger in a car. I can always sit comfortably and I can always have as much surface (haha) as I need to put the device down on securely. This is one of the big issues tech journalists have with this device. If space is at a premium, a regular notebook is much better suited because it doesn’t require an additional kickstand to be propped up. But, I’m from the island of crazy-talk so I have as much space as I need. A little bit of setback is the standby mode of the Surface and battery life. While the iPad is basically always instant-on and ready to use, the Surface goes into Hibernate after four hours of sitting in Connected Standby (or whatever its current official name). It resumes and boots very, very fast but for small things that I want to look up I’ll grab my phone instead. I think a little bit more about whether I really need the tablet to do something or if the phone’s enough. There has to be some reason to have a smartphone, right? Regarding the battery, the Surface doesn’t come close to the iPad but it offers much more power and flexibility in exchange for that. You have to die some death eventually and on Crazy-Talk Island it is runtime. Another thing I have really come around on is the touchscreen in laptop mode. A long time ago, when Apple devices dominated in my apartment, I wrote a piece about how I prefer touch on a computer. While for the most part this is still holds true (e.g. on a desktop computer), I find myself poking at the Surface screen quite often. It depends on the application of course. Desktop Chrome doesn’t work all too well. But the Office Ribbon interface is a good example or modern IE of course. For the few features I use in Word, like inserting a link or an image, I’m faster using my finger to select the item from the menu than with the touchpad. The same is true for scrolling. If the application and situation support it, I mostly scroll on the screen. For example proof reading in Word or researching on the Internet. This also allows for a more comfortable (i.e. outstretched) position of the hand compared to using a touchpad (i.e. cramped). File operations on the other hand are best done using the touchpad. But still, I can now see the value of having a touchscreen on a notebook. Time for a conclusion. Windows 8.1 is a solid operating system, for desktop and tablet. While there are a few things that prevent it from being great everywhere, I don’t think it is as bad as some whiners try to make us believe. The importance of the start-menu is greatly exaggerated. On a Mac there isn’t even one. There you have a folder called Applications or the Launchpad (like an iOS home screen; Hey, that’s like the modern start screen of Windows 8 only without being alive). But, to be fair, that only shows the applications and nothing more. No useless links to websites or uninstall programs and the like. I actually think Microsoft should adopt a similar technique to bundle applications and present them to the user (see the short version on Wikipedia and the long version by Apple). I like Windows 8, on any of my devices, and I would recommend it to anyone with an open mind.